Pettipas, Leo. "Wanipigow Lake Archaeological Site". The Canadian Encyclopedia, 04 March 2015, Historica Canada. https://www.thecanadianencyclopedia.ca/en/article/wanipigow-lake-archaeological-site. Accessed 19 April 2019. Wanipigow Lake is a narrow, shallow widening of the river of the same name that flows in a northwesterly direction across the Canadian Canadian Shield and into Lake Winnipeg. Wanipigow Lake is a narrow, shallow widening of the river of the same name that flows in a northwesterly direction across the Canadian Canadian Shield and into Lake Winnipeg. The Wanipigow Lake Archaeological Site (Borden No. 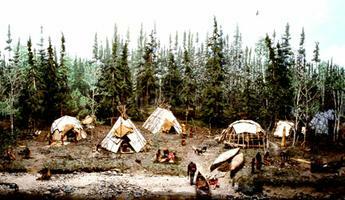 EgKx-1) is one of many early Aboriginal cultural sites that dot the shorelines and river banks of Manitoba's southern Boreal Forest. The English translation of the Ojibwa term "Wanipigow" is "hollow water" or "hole in the water," and is said to signify a place where a river flowing westward from the country of many hills ran into a hole and disappeared. Another account equates it with a whirlpool that occasionally appeared at the first set of rapids located inland from Lake Winnipeg. In the winter of 1974-75, the band council of the nearby Hollow Water First Nation requested the Manitoba government to take measures to preserve the site in advance of a planned cottage-lot development. The provincial Historic Resources Branch contracted with the University of Winnipeg to carry out a three-year field and laboratory program to recover, analyse and interpret the heritage resources of the site. 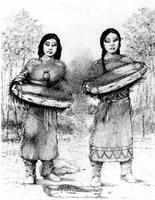 There are four "chapters" in the Aboriginal history of southeastern Manitoba: Early Indigenous (ca. 8000 - 7000 BCE), Middle Indigenous (ca. 7000 - 500 BCE), Late Indigenous (ca. 500 BCE - 1650 CE), and Indigenous/European (ca. 1650 CE - present). 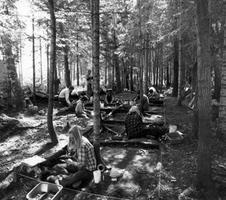 Some archaeologists divide the Late Indigenous era into the "Initial Woodland" (ca. 500 BCE - 800 CE) and "Terminal Woodland" (ca. 800 CE - 1650 CE) periods. 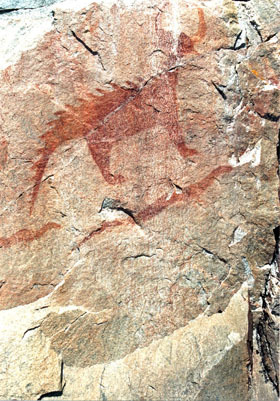 Archaeologically, only the Middle and Late Indigenous eras are represented at the Wanipigow Lake Site. Although the site itself produced no artifacts dating to the Early Indigenous period, evidence of the original pioneering groups has been found in the general vicinity, which became inhabitable soon after the disappearance of Glacial Lake Agassiz. These early arrivals were the distant ancestors to many of the people who came to occupy the Wanipigow Lake Site and other local sites in the centuries that followed. Archaeologists have found 5000-year-old spear points that seem to indicate movements into the boreal forest from the western grasslands. Much of the Middle Indigenous era was marked by severe droughts on the Prairies, and perhaps the western-style artifacts found at the site were introduced by groups seeking respite in the comparatively well-watered and vegetated Shield country of southeastern Manitoba. According to one theory, around 500 years BCE, the beginning of the Initial Woodland period witnessed the northern spread of ancestral Algonquian-speaking Cree people and their culture from a homeland near western Lake Superior. 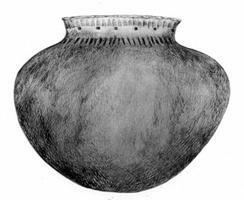 Their arrival in southeastern Manitoba in general and at the Wanipigow Lake Site in particular was borne out by discovery of earthenware pottery, something that was hitherto unknown in the region. Another Woodland innovation was wild rice harvesting. The Wanipigow Lake Site was the first in Manitoba and, as of the late 1970s, one of the largest in North America to yield archaeological evidence of this important economic pursuit. This is the site's chief "claim to fame"; hundreds of carbonized rice kernels dating to the 9th century CE were uncovered, and given its excellent food value we can predict that wild rice continued to be gathered locally throughout the Late Indigenous cultural era as well. It has certainly been the case among generations of the Hollow Water First Nation in modern times. Pottery-making and wild rice harvesting were relatively recent customs, having made their appearance during the Common Era. A much earlier tradition, and one that persisted throughout the entire Indigenous epoch right up until the arrival of the European fur trade, was stone-tool manufacture via the process of flintknapping. 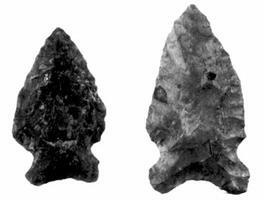 Projectile points (spear and arrow points), scrapers of various kinds, drills, choppers, and knives were among the implements and instruments so produced. These were in turn used to create a wide range of other artifacts from softer materials like wood, leather, bone and antler. Spear handles, archery bows and arrow shafts, lodge coverings, clothing, footwear, and bone awls and needles were all manufactured with stone tools at one time or another down through the centuries at the Wanipigow Lake Site. 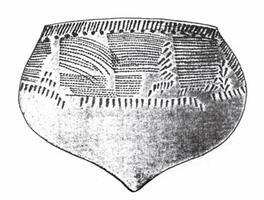 Fabric impressions on Terminal Woodland potsherds reflect the production of bags and baskets from plant fibres. Thanks to the abundance and variety of animal, vegetable and mineral resources available in the vicinity, the inhabitants were self-sufficient in most respects. However, that does not mean that they lived in isolation from the outside world. The great majority of stone from which tools were fashioned on-site was available from local Shield sources. At the same time, artifacts made from Knife River Flint, a very high quality stone material that occurs naturally on the prairies of North Dakota, were recovered from Late Indigenous contexts at the site, and this bespeaks external trade relations or long-range collecting expeditions beyond the local band territories. A pipestone fragment and a piece of copper bear witness to contacts with southwestern Minnesota and Lake Superior, respectively. Another indicator of outside contact is some of the pottery ware found at the site, which is believed to be the product of Siouan and not Algonquian culture. Its presence at the site can be taken to indicate the marriage of Minnesota Dakota or Assiniboine women into the local Cree population in late Terminal Woodland times. Throughout the entire pre-European contact era, the occupants of the Wanipigow Lake Site were hunter-gatherers who lived off the land. That is, their food supplies were derived entirely from wild plants and animals, not from domesticated species. Food remains were especially abundant in Late Indigenous levels. 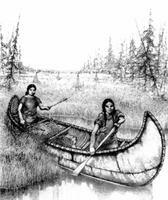 In addition to gathering wild rice and other plant species such as goosefoot, the Late Indigenous people hunted moose, caribou, bear, beaver, muskrat, rabbit and waterfowl, gathered clams, and fished for northern pike in the lake and associated river system. The Wanipigow Lake Site is large, estimated to cover some 2.5 hectares. 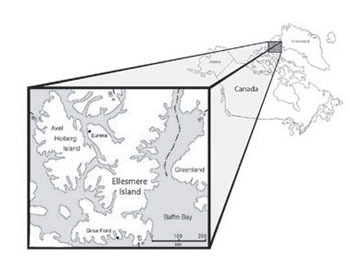 In Late Indigenous times it may have functioned as a summer base camp occupied by sizeable bands whose members broke up into single or extended family groups that dispersed inland during the winter months. In 1980, the Wanipigow Lake Archaeological Site was declared a Provincial Heritage Site under the terms of the Historic Sites and Objects Act of Manitoba.